Get Your Pet From one good home to another. 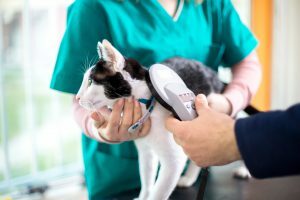 Philadelphia, PA. (February 1, 2019) – getyourpet.com, the national pet adoption site, partners with THRIVE Affordable Vet Care to bring veterinary care at unprecedented value to newly-rehomed dogs and cats. 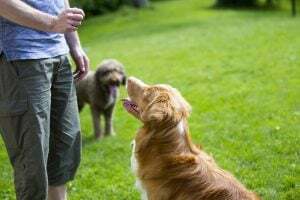 To begin accessing this valuable pet care from THRIVE, pet adopters from Get Your Pet will receive a complimentary first exam in their adoption package. Get Your Pet is the online pet adoption community where people who have to rehome a pet directly connect with people who want to adopt a dog or cat, thereby keeping them out of the shelter. 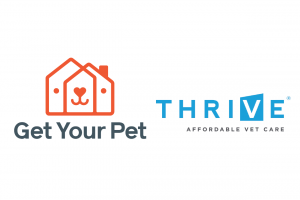 In addition to offering veterinary care at unprecedented value, THRIVE will increase the visibility for dogs and cats in need of rehoming on Get Your Pet with a geo-targeted listing of available pets on their website at each of their locations. THRIVE complements Get Your Pet’s simpler, smarter, more humane approach to pet adoption by offering their clients medicines, diagnostic tests, and equipment for their beloved pets at a substantial discount. THRIVE’s newly launched THRIVE PLUS™ Membership features unlimited pet exams, 10% off services, 10% off dog grooming and training at local Petcos and more. The total cost of a legally-documented pet adoption through Get Your Pet is $99 for a dog and $49 for a cat, which is not paid until the Adopter actually succeeds in adopting a dog or cat. In addition to legal documentation and a voucher for a pet exam from a participating veterinarian, the adoption fee includes eligibility for 30 days’ free pet insurance from Trupanion (some restrictions in CA) and a $40 credit towards services on Rover.com (first time customers, only). Additionally, Adopters who live near Pet Valu Pet stores receive money-saving coupons valuable in-store at Pet Valu. A portion of the profits from Get Your Pet adoptions will go to benefiting local animal shelters. getyourpet.com is an online pet adoption community where people who have to rehome a pet directly connect with people who want to adopt a pet. This simpler, smarter and more humane approach to pet adoption means that the pet need never enter the shelter. The site works like a dating website, where Guardians and Adopters in the home-to-home pet adoption process are in charge. 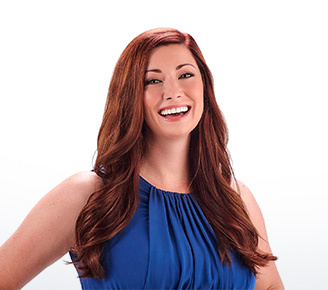 Founder Angela Marcus, a life-long animal welfare advocate and former presenter on Animal Planet, created Get Your Pet as a solution to the heartbreaking problem of too many pets in need of new homes and too little space in shelters to keep them all. Get Your Pet is available across the U.S. A portion of the profits from Get Your Pet will go to benefit local animal shelters. THRIVE’s mission is to provide comprehensive, quality veterinary care for our patients at an unprecedented value to pet owners. THRIVE opened its first location in January 2015 and continues to rapidly grow its network of animal hospitals across the United States. Our focus on wellness extends to the growing needs of our healthcare teams, making Thrive the employer of choice within the veterinary industry. © 2019 Get Your Pet.